Stampede is the world’s leading value-added distributor of integrated AV/IT technology solutions that help resellers meet the expanding technology needs of end-user customers in dozens of commercial vertical markets across the world. Powered by the commitment and resources of DCC, Stampede is ready to unveil a whole new world of exciting business opportunities to their vendor partners. The unchallenged global leader in value added ProAV distribution is now the global AV brand of one of the largest technology distribution companies on the planet. Specifically designed for classrooms, school yards, tour groups & meetings. Extend your voice in large open spaces with the AmpliVox Mity-Meg Megaphones. 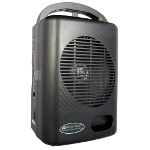 They are ideal for crowd control, announcements in noisy environments or emergency services.